Every now and then I'll get a comment that someone who's short (but actually taller than me) wishes they could wear maxi lengths. You can! In some cases you might need to get things hemmed, or buy a petite length, but both the maxi skirt and dress I'm wearing below haven't been altered in any way to fit my petite 5"2 self. 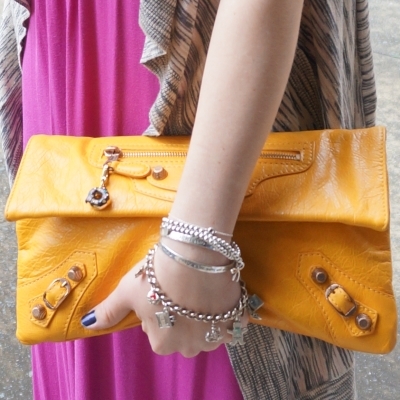 A slightly more formal and more casual way to wear maxi lengths, both with Balenciaga bags. I feel like I say this every time I wear this dress, but I loved this outfit. It is my favourite dress - even in pregnancy it never fails to make me feel good. Wore this to baby boy's dedication ceremony. It's like a christening, the baby wears a traditional gown but there's no baptising. You just thank God for the amazing miracle you have, welcome baby into the family and circle of friends and promise to tell them all about God. It was exciting having baby boy wear the same gown his brother did almost two years ago, it was my dedication gown too and it's been in the family for generations. Wasn't sure if the weather was going to be as cold and rainy as predicted or not so added this cardigan. It was warm enough to take it off for the ceremony and the rain stayed away until later that afternoon thankfully. I've worn a yellow bag with this dress before, it's a great combination. The style challenge for the day was 'lighter' so the bright colour and smaller size met the theme nicely. The clutch did spent most of the time in the baby bag though, as if I wasn't holding baby boy or toddler T or Cooper I had a camera in my hand taking pics. Last worn: brown marle cardigan, cobalt belt, pink maxi dress, gold mouse flats, Balenciaga yellow envelope clutch. Other ways to wear: brown cardigan and khaki tank, cobalt belt and boho dress, pink maxi dress at 39 weeks pregnant, gold mouse flats and skinny jeans, Balenciaga yellow envelope clutch and a lace dress. A much more casual way to wear a maxi! This maxi skirt was an awesome buy when I was pregnant with toddler T. It stretched to accommodate two pregnancies (have to love an elastic waist!) and is still so comfy post baby. With this wrap top it was an easy breastfeeding outfit. Picked the purple scarf as I wanted a little something to keep my chest covered in the chilly morning after all the coughs and colds we've battled the past few weeks, and I really like blue and purple together. Ended up taking the scarf off in the afternoon as it got warmer. Wore this for a relaxed day - went to view a house in the morning and then the in laws came over for dinner. The Converse and maxi skirt together met the 'kicks and skirt' Spring Fling style challenge prompt, and the black maxi skirt was perfect for the 'darker' theme of the TRMstyle challenge. 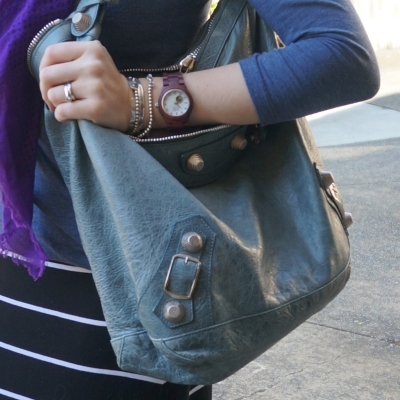 Last worn: Ray-Ban Wayfarer, purple scarf, blue wrap top, striped maxi skirt, Converse, Balenciaga day bag. Other ways to wear: purple scarf and pink bag, blue wrap top and printed jeans, striped maxi skirt and skull scarf, Converse and flares, Balenciaga day bag and denim shorts. Linking up with Friday Faves, Passion for Fashion, Hello Monday, Let It Shine, Shoe & Tell, Modest Monday, Monday Mode. That pink maxi is one of my favourite pieces of your wardrobe! Glad you are still loving it and that you had a lovely dedication ceremony! Beautiful. Love both of your looks. I love that shade of pink. It's so pretty. And I've definitely heard my shorter friends say that they can't wear maxi's but I think they make everyone look taller! I think they do too - most people are surprised when I say how short I am, haha! That pink maxi is gorgeous, I can see why it's your favorite. I love that first maxi on you too! Isn't it nice to have a go-to piece like that you always feel good in. How special that it was what you wore for the christening. I love when clothes hold memories like that. Both looks are great! I can totally see why you love that maxi dress! I love the details on the bottom and the belt is a fun addition too! You always make me want to go out and buy more maxi skirts and dresses--they're always so cute on you. Love both looks, especially those COLORS in the first look...so pretty! I just got a striped knit maxi so your second look is giving me some styling inspiration. That purple maxi dress is fabulous. I love how you paired it with that yellow bag. It is such a brilliant combo. The combination of yellow and purple is always stunning. I agree with what you said about maxi dresses. I think it is just about finding the right fit. It is not about the height, they can look good on petite women as well...and they always look great on you! Sometimes people limit themselves without a reason. Fashion rules are there to be broken. The second outfit is fantastic. It has such a relaxed vibe! Stripes are always a cool idea...and I do like that maxi as well. One of my favourites too! :) It's such a nice colour. Great post and photos dear, thanks for sharing! Love the colors, girl! You look beautiful as always! I need to try out a maxi dress sometime! cute looks! That maxi is a great garment that you've given a good run and it still has a lot of life in it. I had never heard of the dedication ceremony, it sounds like a beautiful tradition. Stripes are so great!! I also love that first maxi dress so much! Maxi looks good on you. I am one of them who said I wish I could wear a maxi dress and I'm 5ft4. LOL! I'm just way too lazy to bring it to the tailor but will definitely look out for petite size in the future. Love the pink dress with the orange bag! gorgeous combo! The bag is awesome, yellow and pink match perfect. Yeah I don't know why so many people say that. I have seen many short people in maxi dresses and they look fine. And this one looks amaze balls on you, and love the color. And that tradition sounds lovely and that is impressive you have had that gown in your family for generations. LOVE the color of your maxi dress! So pretty and fun! I struggle with maxi dresses too, and I'm 5'4", so what am I afraid of?! haha! Maybe if the weather stays warm, I'll try wearing my one maxi dress! You should be able to wear whatever you want and makes you feel comfortable! I love maxis! The color on that first one is so eye catching! I think the idea that petite girls can't wear maxi dresses needs to change, because I've seen many of my petite friends wear them, and they look stunning -- as do you, Mica. I love the story of the first dress; any piece with sentimental value is an automatic yes in my books! I adore the pops of vibrant colour you always input into your outfits Mica! And I love a maxi dress too - and I'm 5'1! I love that purple dress! I struggle to wear maxi's for the opposite problem, it's a little harder to add material than it is to take it off! I love that black and white stripy skirt too, it looks like the kind of thing you could wear 1001 ways and not get sick of. Good luck with the househunt, hope you find something that suits you soon! Love the first color combo! So bright and fun! Stunning looks! The purple dress is just perfect! You're an inch taller than me, Mica! But yes, I agree, petites can wear maxis too. I love maxi dresses and in fact on Monday I'm due to post on how to wear a maxi skirt and denim two ways! 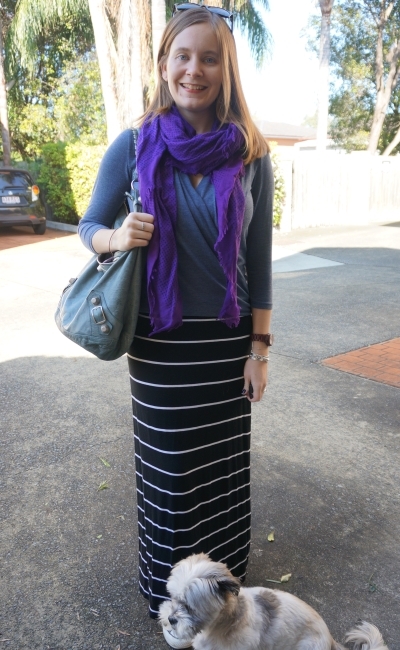 I want to find a good striped maxi skirt like yours. They are so versatile for all seasons - tees in summer, chunky knits in winter! I liked your post -t hat is a beautiful maxi skirt you got! And I agree a striped maxi is such a wardrobe staple! That purple maxi is so pretty! I love the color of the purple dress! Nice styling. I can see why that first dress is your favorite! The color and silhouette are both really pretty on you. And how great that it didn't need to be hemmed. Yes it's the perfect length! :) It was meant to be ankle length but skims the ground beautifully one me hehe. Such great ways to do a maxi! I love the color mix on the first outfit especially. And good luck with house-hunting! The dresses are way too cute.I love them. I love a good maxi dress. I'm 5"2 as well but haven't found a maxi dress that looks good on me; thanks for the inspiration! :D I love the pink one paired with the grey cardigan, very cozy and relaxed! Hopefully you find the perfect one soon! I love the combination of colors in the first look as purple and yellow is one of my favorite color combos. Also, that dress is stunning! Both looks are pretty! I love the color of your maxi dress. I also love your stripe skirt! Both looks are excellent for fall. If you love something, wear it Mica! I love maxi dresses and skirts :D Loving that second outfit also! Black, grey and a smidgen of purple ... Looks beautiful on you! Good luck on the house hunting. That pink maxi is so pretty! I love that ruffle hem detail! Hope the house hunting is going well!